This post contains Affiliate Links. I was also compensated by Minted for sharing a photo and links to the invitations I chose (at absolutely no cost to you!) but as always the opinions expressed are 100% mine. I only ever recommend brands that I truly love, use and stand behind. Thank you for supporting the brands that help support this blog. For more information please see the disclaimer here. 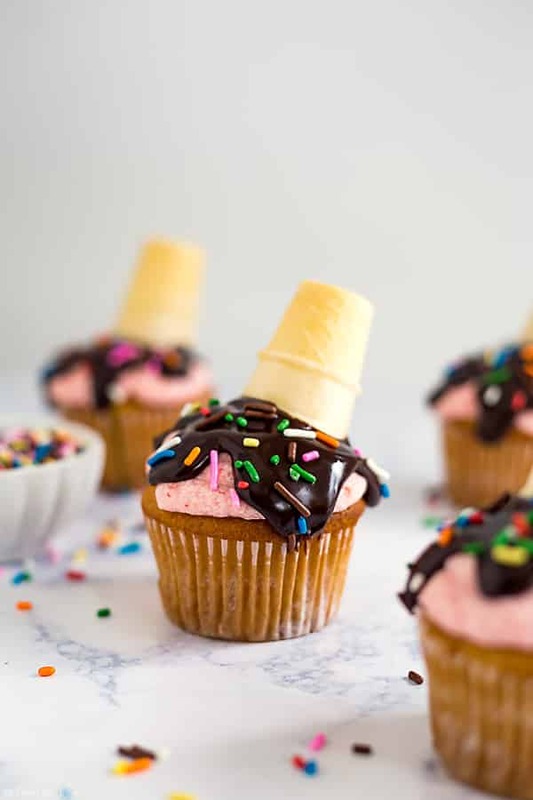 These Melted Ice Cream Cone Cupcakes are such a fun and easy dessert recipe. 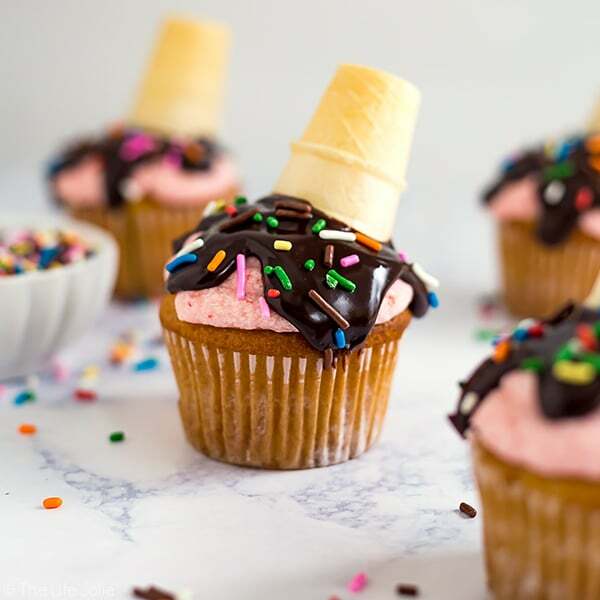 This tutorial is a delicious combination of moist vanilla cupcakes, strawberry frosting, chocolate ganache and sprinkles! 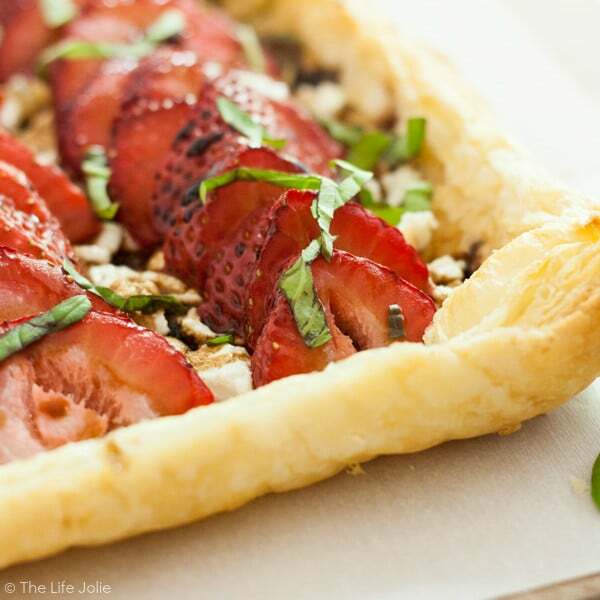 They are perfect to serve at your next party! We are in serious crunch time right now. T’s birthday party is on Sunday- it’s all coming together but we definitely have a laundry list of things to do in preparation. The theme for this party is Tessa’s Ice Cream Social. This was a super easy choice for us because everyone in our family absolutely loves ice cream, especially Tessa! There are so many cute directions to take this theme, so J and I jumped head first into the planning. First things first, we had to get some invitations out. 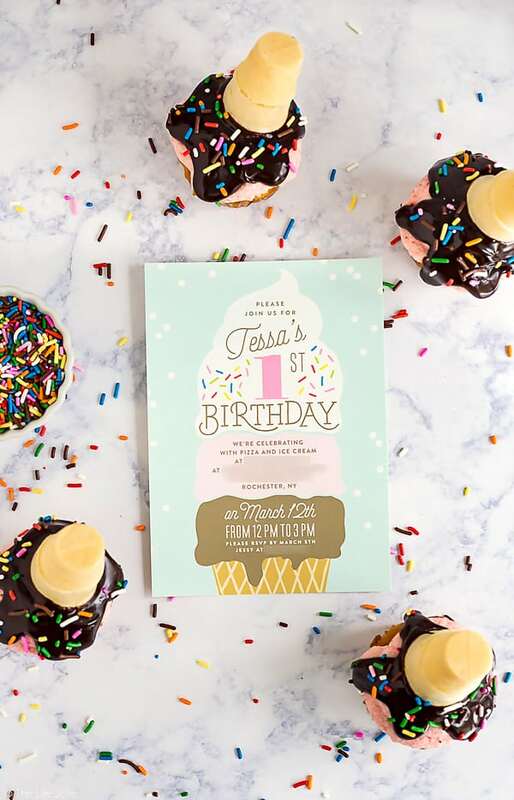 As you may remember I worked with Minted to design the most adorable birth announcements when Tessa first came onto the scene. I love their products so much and it only seemed right to go back and choose some adorable invitation’s for T’s party. We’ve come full circle on this and I love it! You can purchase these invites here (but good luck choosing- there were so many adorable options, we had a very difficult time deciding which to use!). 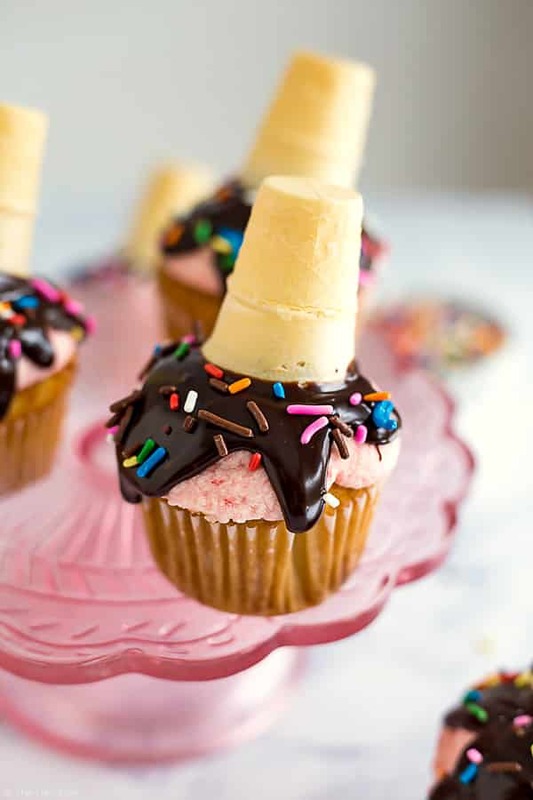 So we’ve all seen those adorable photos on pinterest and facebook of the melted ice cream cone cakes. You know the ones; colorful cakes that look as though someone took an ice cream cone and turned it upside down right on top of the cake. And the cake is decorated to look as though the ice cream from the cone is melting and dripping down the sides of the cake. I’m seriously in love with this idea, but also a little intimidated. You know, me and baking- we have such a love/hate relationship which certainly includes cake decorating. But I really, wanted something like this for T’s big birthday to go along with the massive ice cream sundae bar we’re planning (ugh, you guys I cannot wait to share the details on that in another post. An ice cream sundae bar is always a good idea!). So I put my thinking cap and on said to myself, “Self, there has to be an easier way. Let’s simplify!” And then I grabbed a pencil and some paper and made the most chicken scratch drawing of what I wanted to do. I’m clearly no artist but I had a game plan and I was inspired to get going. Now you can really use any cupcake recipe you want for this and if you go with a box mix, I certainly won’t judge you. 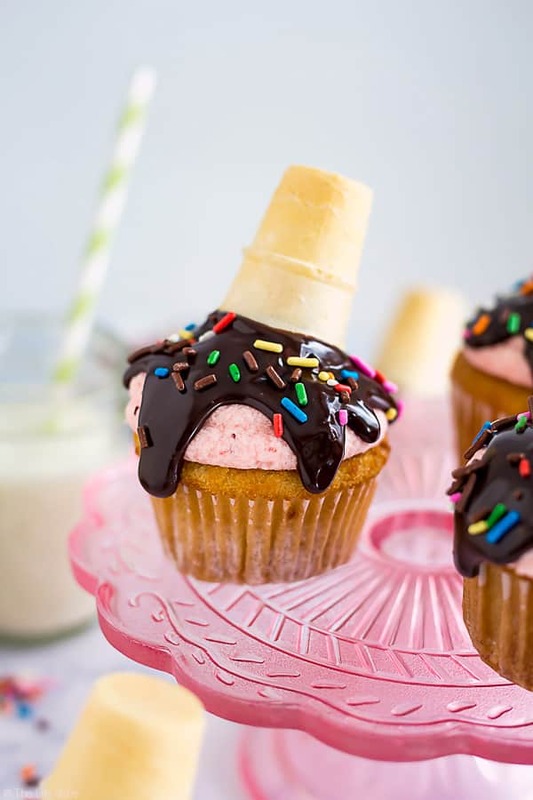 But these cupcakes that I shared last week are the perfect, easy homemade cupcake option for this recipe. And that fluffy fresh strawberry buttercream frosting tasted so delicious with the chocolate ganache. I definitely went back and forth with a few different trusted cooks who know their stuff when it comes to baking and cooking. I suspected a chocolate sauce drizzle would be too thin and end up being an awful mess. I was not even trying to end up in tears as a result of yet another disastrous baking debacle. The opinions were unanimous that chocolate ganache would be the perfect option to get just the right amount of drip while controlling it enough that my entire world didn’t end up covered in the stuff (not that everything being covered in ganache is necessarily a bad thing.). Melted chocolate can be temperamental at best so not having to deal with that was a total plus. And I wasn’t the least bit sad to have a little bit of leftover ganache to dip the leftover strawberries from making the buttercream into. I could not possibly be happier with the results. They have just the right amount of whimsical cuteness that I was shooting for and more importantly, they were insanely delicious! I think my guests will be very happy to enjoy these this weekend! 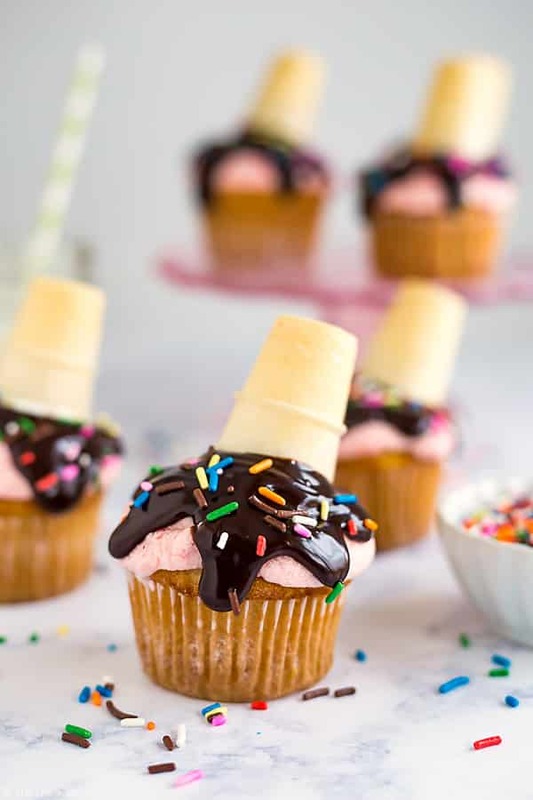 These Melted Ice Cream Cone Cupcakes are such a fun and easy dessert recipe. This tutorial is a delicious combination of moist vanilla cupcakes, strawberry frosting, chocolate and sprinkles! They are perfect to serve at your next party! Pipe swirls of strawberry frosting onto cupcakes and place them into the refrigerator to set while preparing the chocolate ganache. Pour heavy cream into a pan and heat over medium heat, stirring occasionally. Once there's steam rising and it's just beginning to simmer, pour the hot cream over the chocolate morsels in a separate, heat safe bowl. Let it sit for a minute or two and then begin to whisk the cream and chocolate together. At first it will seems as though the chocolate is breaking up into a chocolaty, creamy mess but continue stirring because this is where the magic happens. After a few moments, the chocolate and cream will begin to combine and get darker and smooth. Once they are well combined let it sit for around 15 minutes as it will thicken up a bit to make it easier to control your drips. When it has reached the optimal thickness (to your liking) pull the cupcakes out of the refrigerator and slowly spoon the ganache onto the tops of the cupcakes. Start with a small amount and in the middle of the top of the cupcake and use the spoon to drizzle drips of ganache artfully down the sides. Again, start slow and work in small amounts as you'll have better control that way. One each cupcake has the right amount of ganache drips, take a mini cone by the bottom of it and dip the top rim into the ganache (the way you would if you were putting a salt rim on a margarita glass). Then place it on top of the cupcake at a bit of a diagonal angle. Sprinkle your cupcake with some rainbow sprinkles and enjoy! March 15, 2017 at 10:02 am Thank you :) Bummer about he lack of invites but slumber parties were always the most fun! March 10, 2017 at 3:48 pm I agree with you about the ganache in two key ways: 1, it is the perfect way to go for that drippy look without being totally messy, and 2, it definitely wouldn't be the end of the world if it ended up everywhere.... I think you've really nailed the execution here, and it doesn't look particularly intimidating. Always good when it comes to a baking project... especially when your kid's birthday party depends on it. Strawberry and chocolate sounds awfully tasty, but I love how easily you could swap out the strawberry flavour for whatever particular ingredient your kid (or you...) like to partner with chocolate. I myself am partial to orange. Or hazelnut. Or anything really, because mmmmmmm chocolate. March 15, 2017 at 9:49 am Thanks Sean! I'm seriously excited to try a few different flavor combos- lately blackberries have been pulling me in so that my be the next thing to try! I'm also with you on the hazelnut- it's one of my favorite flavors! March 15, 2017 at 9:47 am Thank you Leah! They were pretty fun to make! March 15, 2017 at 9:32 am Uncle of the year- I love it! March 15, 2017 at 9:31 am Thanks Amanda! I'm with you there- chocolate ganache is one of my favorite things :) Everyone loved them! March 13, 2017 at 7:36 pm These are sooooo adorable!!! Somehow I've gone through life without ever making cupcakes- but I need to fix that! I bet the cone gives it a nice crunch!! March 15, 2017 at 9:11 am Thank you! Both of my girls loved them! March 15, 2017 at 9:11 am Thank you! I love every single thing I see on Minted- it's amazing and totally dangerous for me!